The only book of its kind—and the first to integrate all of the different perspectives on conflict into one coherent and integrated whole. With Forewords by Ken Wilber, one of the most widely read and influential American philosophers of our time, and Vern Neufeld Redekop, PhD, one of the foremost practitioner-scholars in the conflict field. In Integral Conflict: The New Science of Conflict, Drs. McGuigan and Popp take a close look at conflict and sustainability through the discerning lens of Ken Wilber’s Integral theory. The book takes you on an intriguing journey through the history of conflict theory, building to the present day when our need for a more complex understanding of the world’s wicked problems is more urgent than ever. Then Drs. McGuigan and Popp present a robust quadrant-by-quadrant analysis and practical example of how to apply the AQAL model to the world’s most formidable conflicts. Integral Conflict: The New Science of Conflict gives practitioners, theorists, and students alike a powerful tool for engaging conflict and wicked problems of any kind. You will gain a deeper appreciation for the challenges we face as evolving human beings, as well as for how to grow and prepare yourself to meet these challenges. Over the years, legal practitioners have developed a sense of the dynamics of the conflicts in which we are involved as litigators or deal advisors. “Integral Conflict” offers us a much deeper and more explicit understanding of these dynamics, by placing conflicts and law in a wider context, drawing on essential theory from other relevant disciplines such as psychology, game theory and philosophy, and even science. McGuigan and Popp help us understand the different ways in which adults understand their conflicts, which in turn helps us adjust our communication and expectations in an appropriate manner. The authors also shed light on the unavoidable contribution we make to how any conflict plays out, regardless of our intentions and experience. I believe the book is a must-read for any legal practitioner aspiring to be a change agent. Integral Conflict is an amazing book. In it, McGuigan and Popp set themselves an enormous task—to provide a practical framework for integrating all elements of conflict theory with the broader set of theories that are the basis for how we see the world. Using the Integral Theory of Ken Wilbur as their foundation, they bring together the wide variety of theories that inform conflict engagement and peace making with systems concepts, complexity analysis, developmental theory, and social psychology (among others). And they do this in a way that is not just theoretical (or meta-theoretical as they might say) but practical, accessible, tangible, and useful. This is an unusual and needed addition to conflict literature. INTEGRAL CONFLICT is the most important book for the conflict field since GETTING TO YES. Like that classic, published 35 years ago, McGuigan and Popp’s book offers us an entirely fresh framework, remaking our understandings and our routes to action. Conflict practitioners, theorists, and those who just have an interest in the subject will all feel rewarded for spending time with this valuable book. Robert Kegan, Meehan Research Professor of Adult Learning, Harvard University; co-author of AN EVERYONE CULTURE and IMMUNITY TO CHANGE. Richard and Nancy’s seminal work finally names what they have been teaching and practicing for decades – “The New Science of Integral Conflict”. They have clearly and eloquently provided a framework to tie together the many theories and disciplines encountered in conflict resolution. Central to my graduate and post-graduate research, the New Science of Integral Conflict provides a road map from an interdisciplinary approach that combines integralism, postmodern science, complexity, and transdisciplinarity. While the Fraser River conflict is a fantastic example of the New Science of Integral Conflict in practice, this new Science is applicable to a myriad of real world conflicts, and most importantly to my work in the arena of international climate change mitigation. Their book provides a framework and road map to a transdisciplinary approach that gets “at that which is between, across, and beyond [the] disciplinary boundaries” of a conflict. This book is a must read for all my students and graduate researchers! Integral Conflict: The New Science of Conflict is a valuable resource not only for conflict practitioners but for anyone interested in working toward systemic change. The AQAL perspective described in very accessible language by McGuigan & Popp, is crucial for those of us interested in “gentle action”—a creative change process that requires a comprehensive understanding of the complexity of any system so that change can begin organically from within the system and emerge in creative ways, taking into consideration and respecting the unique culture, structures, and values of the system. The authors describe the AQAL model as a kind of map for understanding the terrain of conflict—and a very useful map it is. It guides us through the complexities of cultures and individuals so that we can more effectively work together to solve our thorniest issues. Now that I have read this book, I cannot imagine trying to effect change without an AQAL map. Consciously elevating and mentally liberating. This books breathes new life – a new consciousness – to the phenomenon of conflict. McGuigan and Popp offer a kaleidoscopic lens to observe and consciously analyze the time-transcendent, complex dynamics of conflict from a multidimensional perspective. This lens is a new consciousness, integrating the awareness of the inner and outer, personal and collective aspects of experience. This book is a must-read to awaken this transformative lens. Through it, we may recognize and accept the mental and spiritual gifts conflict offers each of us and our civilization. 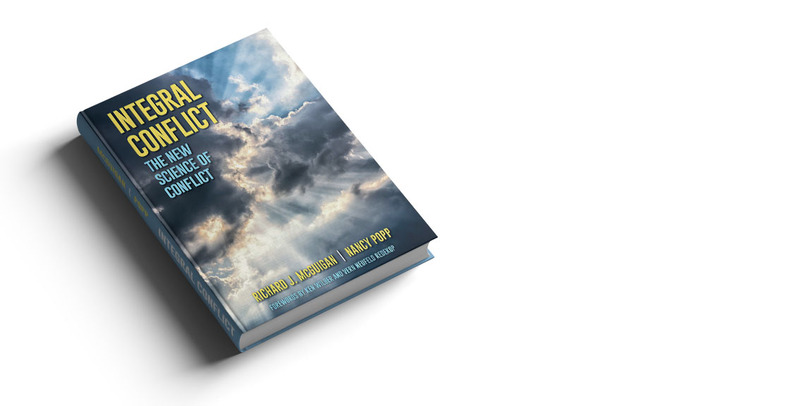 With Integral Conflict, The New Science of Conflict, Richard McGuigan and Nancy Popp have given us a pragmatic tool for conceptualizing and interceding constructively in conflicts arising at all levels of human interaction. Integral Conflict marries the paradigm-shifting perspective of Ken Wilber’s Integral Theory with Robert Kegan’s theories of psychological development across the lifespan. From this new viewpoint McGuigan and Popp have created a tool that has vast applicability to the conflictual interactions occurring both globally and locally. This new way of working with conflict, is not an outside observer’s strategy – not a new way to objectively engage with the stake-holders in a particular situation, but actually a way to change one’s self from the inside out. With clear and concise examples and descriptions, McGuigan and Popp both teach their methodology and promote the evolution of consciousness within their readers. The field of special education is rich with complex issues, emotions, and disputes for both parents and educators. While parents and educators share a mutual concern for the child’s educational program, reaching consensus can be hindered by a whole host of differing needs. McGuigan and Popp’s Integral Conflict is a “holistic” approach to conflict analysis, changing not only how we think about conflict, but also how we engage and experience conflict. Having a “map” to clearly identify and organize all of those differing needs, and more, is one of the greatest gifts of this book, and a much needed and appreciated contribution to the conflict field. This is a must read for anyone in the conflict, leadership, or community engagement fields! McGuigan and Popp have masterfully applied an AQAL approach to the field of conflict resolution – its historic foundations through to its current practice – to create a truly insightful “map of the territory.” They offer a succinct yet comprehensive overview of the conflict field’s emergence and evolution as well as a wonderfully engaging description of Wilber’s AQAL theory and how to effectively apply it to the practice of conflict engagement. Whether you are a seasoned practitioner, a student, or someone exploring the field you will find much to spark interest and insight in this book. It is also a great primer on Wilber’s Integral (AQAL) Theory. In The New Science of Conflict McGuigan and Popp invite us to look through the lens of Integral theory at the experience of conflict in a new and dynamic way. This new mapping of conflict helps us to see “where we have been, where we are and how we got here” and moves forward into showing us different pathways to getting to where we want to be. Conflict in the 21 century will only continue to grow as our world and its resources continue to shrink. We need new and innovative strategies, theories and practices to engage the intricate complexities of our ever changing ‘reality’. Drs. McGuigan and Popp in this volume, show us the way. It remains to be seen if we as a species can follow their lead. I found myself unable to put down this book – it is a page turner that kept me engaged from beginning to end. McGuigan and Popp make an extremely complex issue vivid and accessible, through the application of a lived story. The often contentious lenses of integralism and developmentalism are broached with great care and compassion. I come away with a new depth of knowing about the value of including, in order to transcend. I can more clearly see how each perspective is true, yet partial, and how each has a gift as well as a blind spot. This book should be required reading for any student or practitioner truly interested in moving toward novel solutions for “wicked problems” that incorporate multiple perspectives. McGuigan and Popp, in their stimulating and re-energizing look at how conflict shapes and informs the human experience boldly asks the reader to “let your thinking be challenged.” By asking this, McGuigan and Popp are not asking the reader to simply challenge their thinking, but, they seem to be asking us to challenge ourselves to think about our thinking around conflict in ways that move us towards and challenge us to become more complete. By treating conflict as an opportunity, backed by, McGuigan and Popp’s presentation of historical, scholarly accounts, and AQAL metatheory, this methodology for engaging conflict is not only revitalizing for the conflict resolution field itself but should be inspiring to its practitioners as well. Vital. As the field of conflict engagement grows, so do areas of specialization. This is a sign of maturity and development. And yet, it also represents fragmentation between theorists and practitioners, between problem solving and transformative mediators and more, and fosters islands of separation. McGuigan and Popp are bucking this trend with an integrative book that grounds itself in Integral thinking, known also as the “theory of everything.” Bravo to them, models in their own right as theorist-practitioners, they indeed are helping to pave the path for a more integrative field. I am a huge fan of this book – and have studied it as a textbook in several of my Saint Paul University graduate studies classes. What I found most compelling was that this book manages to provide one of the best overviews I’ve seen of the evolution of the Conflict Field, making the case for why a ‘new science’ is needed at this time. At the same time, the book emphasizes the importance of the ‘Integral Intervenor’ – one who has prepared in both exterior and interior ways to properly handle conflict, especially in complex situations. McGuigan and Popp have managed to weave together the insights of many key thinkers from a variety of fields, presenting a groundbreaking and inspiring framework which has the potential to vastly improve the success of any conflict intervention. I am so very pleased to endorse a book I loved for its “bridge between theory and practice, applying Wilber’s quadrants to explain individual and societal motivations and behavior to the practice of solving the Fraser River fishing conflict. As the world watches the indigenous struggle versus resource developers (pipeline, police, government) at Standing Rock (December 2016) and elsewhere, it is more timely and relevant than ever to achieve peaceful resolution based on mutual understanding by using McGuigan’s holistic, integral techniques in the River dispute. I wish this book had been written years ago—McGuigan and Popp’s insights would have helped enormously in my environment-related advice and capacity-building in developing countries while I was working with the United Nations and World Bank environmental law units, as well as with CIDA. Now at Global Affairs Canada, I can apply the insights in “Integral Conflict , the New Science of Conflict” as a reliable and trusted resource to much of the work I do. Ralph Osterwoldt, Rhodes Scholar, Oxford; environmental lawyer at UNEP, World Bank, and Federal Departments of Justice, Parks, and Environment Canada; environment specialist in development assistance at CIDA and Global Affairs Canada. Integral Conflict makes a bold and unique contribution to the conflict resolution field. McGuigan & Popp present a theoretical and practical framework that both encompasses and integrates all the perspectives and disciplines that must be considered and applied to address any conflict constructively and sustainably. Drawing from deep scholar/practitioner knowledge and experience, they demonstrate how integral theory can serve as a guide to navigating the multiple facets of a conflict situation. In doing so, they make the case for how integrally informed methods of conflict analysis and engagement can contribute to better understanding of conflict, and to more effective responses. This book is highly relevant for conflict resolution practitioners, scholars, and students interested in holistic approaches to creating knowledge and taking action for peace. Integral Conflict: The New Science of Conflict challenges me to the core of what I believe about conflict, what I understand about myself as a human engaged in my own conflicts, and what is required of me as a conflict practitioner. When I first encountered the Integral model at Antioch University’s Master in Conflict Analysis and Engagement program I realized that my 20+ years of experience in the conflict field was like walking across a two dimensional field whereas opening to the possibilities of Integral Conflict was like being lifted into a multi-faceted, multi-dimensional spinning orb. With this book, Richard McGuigan and Nancy Popp invite us – scholars, practitioners, and planetary citizens – to acknowledge and appreciate the deep complexities of the whole of conflict. They invite us to explore the interwoven threads of the inner and outer dimensions and the individual and collective construction of identity, meaning and conflict. McGuigan and Popp provide a guide, a rich sourcebook of theory and action for “transformational learning—changing the shape of our minds, transforming them…an evolutionary process through which we can increase the complexity of our perspectives, our identities and our understanding” (p.236). And we are all better for that challenge.